Remember that time that General Motors claimed the title of the biggest carmaker in the world last year? Toyota, which has had a year littered with recalls, fines, and boycotts, has somehow beaten all those odds and will reclaim the title from GM. We like to think the Toyota 86/Scion FR-S is the reason why they reclaimed the lead despite the lack of any evidence that's the case. 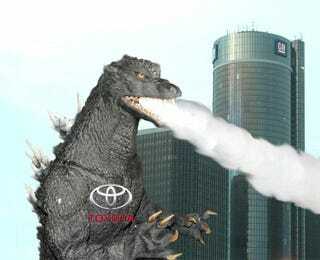 The last few years have not been good for Toyota in the "not recalling cars" department. Worldwide sales for Toyota will reach a staggering 9.7 million cars, an increase of 22 percent from 2011's sales. Toyota lost the crown in 2011 thanks to the terrible tsunami and earthquake that struck off the coast of Japan. GM will fall to second, with 9.3 million anticipated sales, while VW is quietly waiting in third for the full effects of its continued beigekrieg to be realized.